Clotilde Dusoulier is a twenty-seven-year-old Parisian who adores sharing her love of all things food-related—recipes, inspirations, restaurant experiences, and above all the pleasure of cooking with the fresh ingredients found in her local Montmartre shops. But her infatuation with food was born not in her mother’s Parisian kitchen, but in San Francisco, where she moved after college and discovered a new world of tastes. When she returned to her beloved France, her culinary exploits inspired her popular and critically acclaimed blog, ChocolateandZucchini.com. In her first book, Dusoulier provides a glimpse into the life of a young Parisian as she savors all that the city has to offer and shares her cooking philosophy in the form of more than 75 recipes that call for healthy ingredients (such as zucchini) and more indulgent tastes (such as chocolate). The Los Angeles Times calls her recipes "simple, charming, and fun." Appetizers such as Cumin Cheese Puffs, sandwiches and tarts like Tomato Tatin, soups like Chestnut and Mushroom, main dishes including Mustard Chicken Stew, and desserts like Chocolate and Caramel Tart can all be found alongside menus for entertaining, as well as tips for throwing cocktail or dinner parties with French flair. 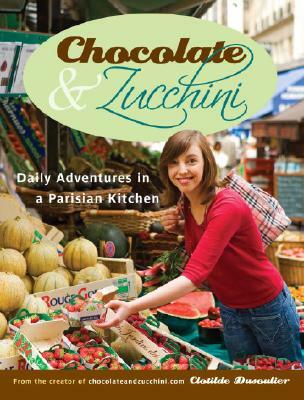 Chocolate & Zucchini is the book for anyone who has journeyed to Paris and can still recall the delicious flavors and aromas—or for those of us who only dream about them. CLOTILDE DUSOULIER lives in Montmartre. Her award-winning blog, Chocolate & Zucchini, was launched in 2003. "This collection of remarkably accomplished recipes, from market-fresh salads to indulgent desserts, includes a soupçon of tasty tales and tips from Clotilde’s Parisian kitchen, and is sure to inspire readers and cooks no matter where they live." "Is there any food lover who doesn't dream about living, cooking, and eating in Paris? This charming homage to French home cooking feeds that fantasy with a feast."